Eco-design of robots is a field of research which has been rarely explored in the past. In order to considerably decrease the environmental impact of robot during the design phase, metal or carbon composite parts can be replaced by bio-sourced materials, such as wood. Indeed, wood has interesting mechanical properties, but its performance/dimensions will vary with the atmospheric conditions/external solicitations and with the conditions in which trees have grown. This paper deals with the design of a stiff and accurate wooden five-bar mechanism. First, a control-based design problem is formulated. 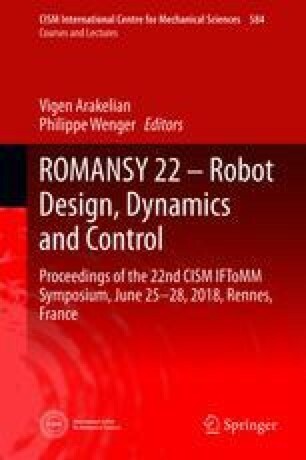 This problem aims at finding the optimal parameters of the robot, taking into account the nature of the desired control (sensor-based control). Then, reliable topology optimization methodology is proposed, taking into account the variability of the wood performance and that will allow the definition of robot architectures (shape of the links) for which the impact of this variability in terms of deformation is minimal. Finally, the optimal design variables are given and are used for the realisation of industrial prototype of a wooden five-bar mechanism. This work was supported by the project RobEcolo funded by the French Région Pays de la Loire (Convention No. 2015-10773). The authors would like to thank Pauline Lafoux and Victoria Safyannikova for their work on the CAD design of the RobEcolo prototype.